I’ve long had a fascination for geese. The mystery with which they can accomplish greatness. Their coordination, communication, perseverance, commitment, trust… they instinctively know that to achieve their goal, survival, they must work together. It’s downright beautiful. Each goose on it’s own is vulnerable but as a community they are strong, determined and effective. They take turns leading in the sky and when one grows weary another steps up to shoulder the responsibility for the greater good of the gaggle. This year’s Project Peace 2018 pattern deliberately includes the flying geese motif inspired by the quilting pattern “flying geese” as I wanted to capture these characteristics of geese that are vital to our own personal survival as well as us collectively. We must figure out a way to work together… participating, engaging, helping others, compassion despite differences, if we truly want to shift our own personal world or the world at large to one that chooses peace. 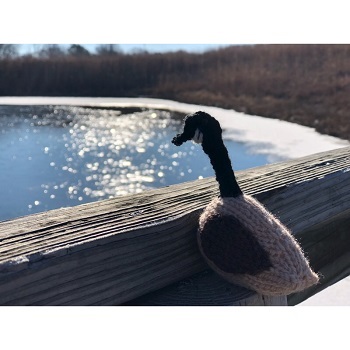 Whether the geese in your project are visible or not based on your chosen yarn is not the important aspect… inspiring reflection related to geese and peace while knitting was my goal. I reached out earlier this fall to Nicky from Knit For Victory to ask if she had any Canadian geese patterns. She offered to create one just for us. And the goose she created is perfect! I asked for name suggestions and wow… did you ever deliver. A week ago, I settled on a name that was near and dear to my heart and had so many connections to Project Peace but a couple of days ago, after the package arrived containing our goose, I instantly knew her name. You can download a copy of the pattern for Pearl on Ravelry. It’s a gift from Nicky so it’s free for all. I can’t thank Nicky enough for such a generous gift. The name Pearl, in case you hadn’t yet said “a-ha” is a spin-off of the knitting term “purl.” Not everyone likes to purl, it’s awkward, it slows us down, it can even mess with our gauge… But just think if the only stitch ever developed was the “knit” stitch. We would be limited in what we create… there would still be a lot of options but the purl stitch, the other half of stockinette provides just that… the other half. So, her name, Pearl is to remind us that we can find beauty everywhere. Today, as you knit ponder how geese relate to the greater good of our world and how you might work to be more like a goose. The flying geese pattern is simple a series of half-triangles with the top touching the bottom of the next triangle. For a simple activity to create a moment to pause, consider doodling the flying geese pattern. And don’t forget to download your copy of Pearl.